Listen to this conversation between a Connecticut woman and Lt. Vance of the Connecticut State Police about the states recently passed gun registration law that’s made 100,000+ residents newly branded state felons. She’s rightfully bringing up questions about the Constitutionality of Connecticut’s new law which requires registration of firearms…and Lt. Vance at every turn abdicates responsibility of protecting people rights to ‘the state’. But worse, he reveals at the end what he really believes: that he and the government are ‘master’ and we are subjugated to them. Police in this country are becoming more militarized (we’re seeing vehicles of war on American streets now), and police across the country are acting like complete thugs as we see acts of police brutality at levels never before seen. Listen to this guy as he states that he must do whatever the Supreme Court and his authorities say he must do. Really? So now you’re an unthinking cop ‘just following orders’. How many times in history has the ‘just following orders’ excuse been used to justify being a complete wimp and committing atrocities against your own people? 2 – “I am the master” Lt. Vance declares as the woman rightfully tells him that taxpayers pay his salary, that the people are the ‘master’ and that he should be serving the people. This is the garbage thinking that our law enforcement are being indoctrinated to believe, so that government will have total control – that they are our masters and we must be completely subservient to them without question. Of course, they are really complete idiots and wusses so believing this really helps supplement their crappy self-image as they become enemies of their own people. The situation in Connecticut continues to worsen. A YouTube video just released shows a woman phoning Lt. Vance of the Connecticut State Police. She claims that her husband is one of the 100,000 newly branded state felons, resulting from Connecticut’s unconstitutional law regarding so-called “assault weapons.” She questions the Lieutenant regarding his stance on following through with possible confiscation orders. Now there’s no doubt in my mind that she “baited” him. What’s surprising though is how he responded. 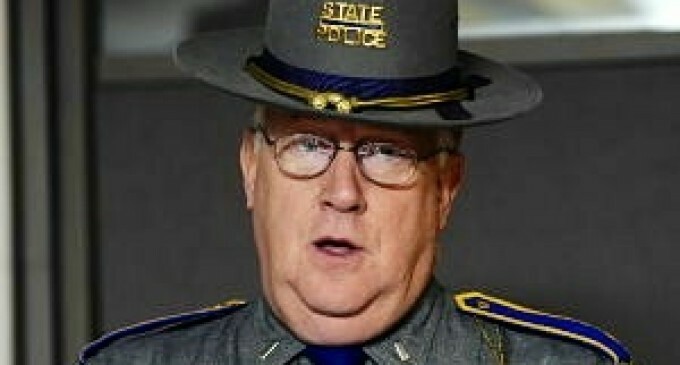 The Connecticut State Police have sent out 214 letters thus far; 106 to rifle owners, and 108 to magazine owners. These 214 “former” (I use the term “former” loosely) law-abiding state residents attempted to register past the deadline, and by doing so have painted a big fat target on their backs. The state estimates that there are over 300,000 plus so-called “assault weapons,” and over 2 million magazines still remaining unregistered by over 100,000 residents. So now what? That’s the million dollar question. Based on the recent sequence of events, one would assume that attempted confiscation and arrest would be the next logical step. This is already the largest act of civil disobedience that “The Constitution State” has ever seen. Confiscation will likely result in physical casualties to both sides, all over an unconstitutional bill that Governor Malloy signed into law. The sad part is, the physical tragedies that may take place will happen to our citizens, and police officers, not the lawmakers! So the ball is largely in Connecticut’s hands right now. We as law-abiding gun owners will sit back and watch this situation closely, and IF Connecticut decides to enforce an unconstitutional law by force, that changes everything. I can’t speak for all gun owners, but I can speak for Gun Rights Across America and for myself. I can assure each and every one of you reading this, that I WILL STAND WITH MY BROTHERS IN ARMS AGAINST A TYRANNICAL GOVERNMENT IF NEED BE! He is not my master or will he ever be. I would say to him that he can kiss the sweet spot on my a**. We can’t vote them out but they can be fired. So then, they really didn’t have a hat that would actually fit your fire-plug head? And, what about those chins? Exercise not working for you?? ?